How very strange is the viewpoint of many of the world's other nations. Syria has just been chosen by the nations of the United Nations to serve on a UNESCO committee that deals with human rights violations. Despite killing 3,500 protestors to the ruling Syrian regime, Syria was just reappointed to serve on the UN Committee on Conventions and Recommendations. This committee examines the violations of nations of human rights in education, science, and communications, among other areas. The United States just recently froze its funding of UNESCO because it had admitted Palestine as a member. Terrorist nations are thought by many U.N. countries to be best put in charge of monitoring human rights violations. More rational observers will clearly recognize that means the U.N. views human rights as a farce. The United States backed draft resolution in the United Nations condemning Iran of human rights violations passed by a vote of 86 - 32. But of the ten largest recipients of our foreign aid, only Israel voted for the resolution, while the two largest aid dependents, Afghanistan and Pakistan, voted against the resolution. Iraq did not vote at all, while Egypt, Jordan, South Africa, Kenya, Ethiopia, and Nigeria all abstained. As is commonly the case, Russia and China voted against us. India, which used to usually vote against us, but more recently has been more likely to see its interests as more consistent with ours, also voted against the resolution condemning Iran. Our ever greater commercial ties with India and China have not caused either nation to become consistently rational in its foreign policies. Such additional lines of communication as exist with the people of these countries has not led to their understanding that tyrannical governments are morally repugnant and make bad friends. Once again, many nations of the world express their disdain for individual rights. The defense of individual rights has to be maintained with vigor around the world and within the United States. While Obama, Biden, Pelosi, and Reid have little regard for many of our individual rights, they are trending in the direction of the crueler and more ruthless nations of the world, but are not yet a match for them. We need badly to choose American leaders who will work to establish the many essential individual rights that are now so widely ignored even in the United States. When the United States lives up to its own standards of rights as proclaimed in its Declaration of Independence and as sustained by the Constitution, perhaps many of the people of the many rogue nations today will also be inspired to assert their own individual rights. The best foreign aid we could offer would be a better example of devotion to individual rights for Americans. 1) More uncertainty among these scientists than one would expect given their claim that the science is settled. 2) Admission that the global climate computer models are wrong about how they handle cloud cover. Since cloud cover effects are by themselves easily large enough to account for all the claimed global warming, this is a serious fault. 3) Acknowledgment that the global climate computer models are tuned to match the climate results on the ground claimed by the catastrophic man-made global warming advocates. This is a very serious charge, since if you have a data set of 100 data pairs, a 100th order polynomial will fit that set exactly. The computer models have thousands of adjustable parameters which provide huge leeway for tuning the desired outputs to past climate results over a few decades. The computer model advocates have explicitly met such criticisms in the past with denials. The fact that the models have claimed to match the results of the last few decades in many cases, but have failed to provide predictive matches to the last 12 years or so, is very telling as well as the admission in the e-mails. One also does not hear of studies for which a given computer model that has been tuned for recent times gives accurate climate results for say the Little Ice Age or the Roman Warm Period. 4) There is an admission that many studies have failed to find the computer model predicted warming of the troposphere at altitudes of 8 to 12 km or more and there is only one questionable study that claims to have observed such a warming. If this computer model prediction is wrong, then the science of the computer models is wrong. 5) There is a claim that the solar incident infra-red radiation is underplayed by the alarmists, who rely on one paper which is contrary to several other published papers. This is important because it is critical to know how much of the incoming solar radiation never reaches the ground due to absorption in the atmosphere. Increased water vapor and CO2 will also reduce incoming solar radiation thereby providing a cooling of the ground temperatures as explained in my analysis in a chapter of Slaying the Sky Dragon - Death of the Greenhouse Gas Theory. 6) Admission that the long term temperature reconstructions by the catastrophic man-made global warming advocates were not on a solid footing. Errors were actually so large that comparisons of such data to computer models was of little help if the errors were acknowledged. The Little Ice Age, the Medieval Warm Period, the cool period of the Dark Ages, the Roman Warming and other periods of natural temperature changes are all awkward for those claiming that the recent warming is both unusual and caused by man's emissions of CO2. 7) Admission that Steve McIntyre may be right about how the statistical handling of the temperature data may have been the artifice source of the hockey stick temperature reconstruction of Mann. 8) Admission that none of the climate computer models performs adequately in predicting sea surface temperatures and water vapor concentrations. This is critical because water covers 71% of the Earth's surface and all of the supposed predictions of CO2 warming actually are supposed to cause more warming due to the inducement of higher water vapor concentrations. The water vapor increase will produce more water vapor warming than the CO2 causes warming by itself according to their theory. 9) There is no need for any one global climate computer model to be correct. Does this not admit that the science is not understood, since otherwise one would give a reason for why that model was incorrect and why its non-compliance with other models or reality was not important? The outlier model might be the only good one, if one does not really understand the science. It is interesting to note that when one of the models is run multiple times, it gives many different answers. One wonders how many outlier results are thrown out because they simply are not believed in. Many of the IPCC models were not run enough times to even understand how poor the reproducibility was. 10) There are many discussions of cherry-picking data sets or papers that showed more warming or more harmful effects to demonstrate a more alarming result. This was true of dramatic events such as storms, advice to emphasize iconic animals, plants, and geographic areas, ways to reconstruct past period temperatures, and advice to ignore some climate extremes of the Medieval Warm Period such as droughts. 11) Concerns that the effects of the sun were not given enough strength in the models and if they were, they would greatly reduce the claimed effects of greenhouse gases. 12) Concern that contrary to the models, water vapor over land in the tropics may not have actually increased as CO2 increased. 13) Admission that the melting of the Kilimanjaro glacier was not caused by global warming. 14) Concern that European forests are thriving as CO2 concentrations increase, rather than being harmed by acid rain caused by increased CO2 concentrations. 15) Puzzlement that there is a minimum in the temperature in the lower troposphere which cannot be duplicated in any computer model that allows surface warming. 16) Phil Jones whose paper on the urban heat island effect minimizes the size and variability of such an effect, though studies in the U.S. and China show it to be very large, claims that there is no change in the heat island effect in New York, London, and Vienna in the 20th century! He also claims the oceans have warmed at a rate consistent with the land warming, which is a claim many would say is false. 17) There is more discussion of seeing that only those friendly to the catastrophe hypothesis are chosen for significant positions in the writing of the U.N. IPCC reports and reviewing them. 18) There are more indications that politics is strongly driving the desired scientific outcomes and that those who are not so committed to the political and pro-government stand of the alarmist viewpoint are untrustworthy and to be generally excluded. 19) There is further discussion of the need to hide original and raw data from scientists and the public not deemed to be dependable to the cause even if publications and research based on such data was funded with government money by countries such as the United States and the United Kingdom that have freedom of information acts on the books. 20) There is a claim that officials at the U.S. Department of Energy are complicit in hiding original weather station data. This is important, because the primary claim to warming in the last few decades is mostly supported by land-based data from weather stations. The rural stations do not show such temperature rises as are claimed by various government agencies of the U.S., the United Kingdom, and many other countries around the world, however. The claims of warming are generated by massaged data by interpolation schemes over regions with no weather stations (or whose station data was ignored) or by large corrections made or not made to data from stations affected by urban and suburban sites and with sitings that do not meet required specifications. The urban sites tend to have rising temperatures due to man's local activities and structures. Scientifically, it is very important to be able to examine the raw data and to have independent scientists examine whether any adjustments are performed correctly. Of course, it may well be that an honest scientific assessment would conclude that there is no way to even use such data given the size of the temperature shifts for which one is looking. It is my contention that no data from any station that does not meet specifications should be used and no data from stations affected by urban heat island effects should be used. 21) Claims that the governments want them to tell a very strong story of climate change caused by man with no caveats. The team of advocates has a duty to see to it that this is the case and to serve as active proponents of the political message. 22) Discussions that advocates should talk up the desirability of stable climate and avoid discussing the costs of cutting back on the use of fossil fuels and the sacrifices people would have to make to do so. I have been pointing out that the science behind catastrophic man-made global warming was largely wrong for years now. One of the most common rebuttals I am given by its proponents is that if the science were so wrong, then many conscientious and eager to prove themselves climate scientists would be aligned with me and making their careers in doing so. Many of these same critics of my viewpoint that the hypothesis of catastrophic man-made global warming science has failed, constantly claim that those who are skeptics and deniers are all in the pay of the fossil fuel companies. That claim is wrong, but catastrophic man-made global warming proponents establish the idea that they think scientists will deliver the desired results of their funders. This may be a projection of their own shortcomings upon others. Let us use their claim that scientists are so vulnerable and apply it to the many climate scientists who support the hypothesis of catastrophic man-made global warming and ask who funds them. The answer is that they are all funded by governments and the U.N., all of which have a decided interest in having reasons to increase the powers of their governments or the U.N. and increase controls over the activities of individuals and companies. That the government of the U.S. is so biased in favor of this hypothesis and is so determined to declare it settled science, is backed by the e-mail referred to above in which the U.S. Department of Energy was noted to be happy not to make original station data available to scientists not under their funding control. There is huge pressure on all scientists in climate research to provide the results the funding governments want, or their funding will be cut off. There is no comparable replacement source of funds, so almost everyone toes the line or is simply naively influenced by the argument from authority because so many do toe the line. The U.S. government is doing more harm to science than Stalin did with his Lysenko perversion. Contrary to what government would have you believe, there is no settled climate science on catastrophic man-made global warming, except that any possible warming is greatly exaggerated, as are its consequences. We must always remember that man has always prospered most when the Earth was warm. This has been most clearly the case since the Holocene period began. 1) A government which is highly limited by principle in power and scope to the purpose of protecting the equal, sovereign rights to the individual to life, liberty, property, the ownership of one's own mind and body, and the pursuit of personal happiness. This is the legitimate government envisioned by the Declaration of Independence and the Constitution. 2) A so-called pragmatic government not restricted by principle to a limited scope and with few powers which is inclined to bestow special privileges on special interests. Such a government may be a democracy, an oligarchy, a one-party state, or a dictatorship and it must of necessity trample the rights of the individual because our personal interests are too diverse for government to foster all of our interests. It must pick which interests it will favor and which it will suppress. It violates the principle that government should do no harm. This is the kind of government we now have. The media generally has failed the People because it does not believe in the principles of limited government and of the equal, sovereign rights of the individual. Rather than being watchdogs of our freedoms, they are mostly advocates of further infringements upon individual rights. The Democrat Socialist Party scoffs at the very idea the Constitution limits the powers of government and that the Declaration of Independence is even a document with standing in the U.S. Pelosi, Biden, Obama, Waxman, Waters, and many other Democrats have literally confirmed this scoffing attitude with explicit comments. Many Objectivists and Libertarians are fond of saying the Republicans are just as bad as the Democrats. The Republicans very frequently violate the Constitution, but they do sometimes try to use it to reduce the rate of government expansion and they rarely scoff at it. It is mostly Republicans who have tried to get ObamaCare declared unconstitutional and have tried to defund it in the House of Representatives. Such fairly stout defenders of freedom and individual rights as there are, are in the Republican Party. The valuable Tea Party movement is rightly mostly voting for and supporting Republicans, while trying to reform the party. I can think of no one in the Democrat Party who is a stout defender of freedom beyond a few points of narrow focus, such as opposing DOMA, DADT, and supporting abortion rights. As for Bush being as bad as Obama, that is a gross exaggeration. He was not fiscally responsible, but he was not in a league with Obama in the amount spent and certainly not as bad at just throwing away the money spent. If we cannot educate the public to demand principled and legitimate government (as defined in the Declaration of Independence), then there is no path to good government. It must of necessity degenerate into special interest politics such as we have now. Those who want to stop the discussion of principles will never matter a wit to substantial improvement in the idea of good government. It can be helpful to get people to listen to principled discussion to point out the absurdities into which pragmatic, special interest government falls and to ridicule it. I do this frequently on my blog. But in the end, no major improvement in government will come about unless the People believe in the equal, sovereign rights of the individual and understand what those rights are. You'd think that Obama would have locked up the environmentalist vote with the billions of tax dollars that he's sent their way already [before denying the Keystone XL Pipeline]. We learned additional details about that corrupt process this week when it was revealed that more than $16 billion of the $20 billion spent by Obama's clean energy loan program went to companies linked to former members of his White House staff, prominent corporate campaign donors, and campaign contribution bundlers. The U.S. Constitution begins with the words "We, the people," and goes on to frame a government that is supposed to be their servant. It's time Washington was reminded of who serves who. The editorial also addresses the fact that our Congressmen tend to enrich themselves with insider information and the power of their positions. This is the natural state of any government that views itself as pragmatic and does not have any respect for the rights of the individual and the limited government it requires as embodied in the American Principle of our Declaration of Independence and our Constitution. 1) Greatly lower the corporate tax rate, which is the highest in the developed world. 2) Repeal ObamaCare with its high taxes on health care, its requirements that the young subsidize the old and the healthy subsidize the unhealthy, and its effect of raising health insurance costs so high more and more American companies are no longer providing it as benefit and fewer and fewer people can afford to buy in on their own. 3) Repeal the minimum wage law which keeps under-educated Americans from getting on the job training so they can acquire job skills worthy of higher pay. 4) Stop draining the private sector of its wealth and income to grow the government parasite ever larger. 5) Stop Dodd-Frank and Sarbanes-Oxley which cause American companies so much financial grief. 6) Stop trying to prevent coal mining and the use of coal to provide low cost and dependable electric power. 7) Stop trying to prevent oil and gas field development. 8) Stop preventing the building of oil and gas pipelines which can cheaply deliver their products to industry to make goods for the American economy and for export. 9) Transfer the unpaid tax collecting and filing duties from employers to employees, who then can evaluate the work involved in tax compliance and taxes paid better when they vote. 10) Stop using the government to interfere with freedom of contract in favor of union extortion schemes both in employer-employee agreements and in forcing companies to choose union-controlled states over those which are not union-controlled. 11) Stop mandating that expensive and unreliable so-called green energy must be used for electricity generation, thereby hurting the coal and natural gas industries and every industry and every household that uses energy. 12) Stop subsidizing and requiring the use of ethanol blends in gasoline which drives up the cost of doing business through increased fuel cost, increases our food costs and deprives us of food to export, and leaves consumers with less to spend on other goods and services. 13) Stop the nonsensical EPA declaration that CO2 is a pollutant and the NASA and NOAA claims it is a likely cause of catastrophic man-made global warming. 14) Get the government out of education so we can have the best educated workforce in the world and young people who will not be so indoctrinated into believing that socialism is good and commerce is bad. 15) Reduce FDA, FCC, FAA, SEC, NLRB, OSHA, IRS, and many other agency's direful impact on business efficiency. 16) End the death tax that kills so many small and medium sized American companies or at least sets them back badly upon the death of a primary owner. 17) Reduce the capital gains tax so the the American economy can be sped up and more efficient. 18) Flatten the income tax so personal commercial success is punished less and people have more income to invest in businesses. 19) Stop general government overspending which forces the Federal Reserve to purchase the Federal debt bonds, thereby flooding the economy with money and causing the cost of goods and services to go up. 20) Stop spending more than tax revenues can pay for so that our economy is not hobbled with high taxes to pay interest on the ever-growing government debt. 21) Foster recognition that businessmen are providers of goods and services that the purchasers believe improve their lives, which is why they voluntarily buy them. Thus, businessmen are bringing value to others and doing good. When people do good their government should not be trying to vilify them and punish them. Do these things and the President of the United States will not be running around the world begging other countries to do business with us. The people who run companies in those countries will be swarming to the U.S. to ask our companies to do business with them. People want to work with the best and we can be the very best if the government gets off our backs. In an interesting development following the Obama block on the Keystone XL Pipeline project which was to bring oil from the Alberta tar sands and the North Dakota/Montana Bakken oil shale formation down to Cushing, OK and on to Houston/Port Arthur, TX, two private companies are seeing to it that the pile-up of oil in Cushing has a pipeline route to Houston. The Seaway Pipeline has carried imported oil from Houston up to the pipeline central routing facilities in Cushing, OK for years. 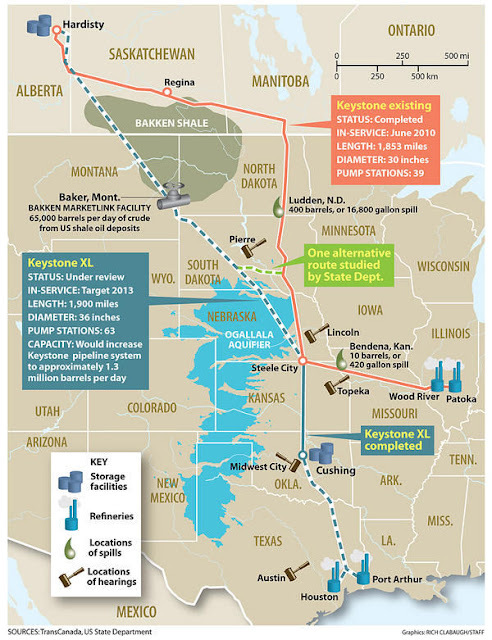 That pipeline was owned half by its operator, Enterprise Products Partners, LP of Houston and half by ConocoPhillips. Enterprise Products Partners has long wanted to reverse the direction of flow to carry the comparatively cheap and plentiful oil in Cushing to Houston area refineries which have been hurting for oil due to diminished supply from Venezuela and Mexico. The pile-up of increased American and Canadian oil in Cushing has caused that oil to sell for as much as $28 a barrel less than the world price. ConocoPhillips did not mind this because it operates oil refineries in Oklahoma which were making a fortune on refining the under-priced oil there. But, ConocoPhillips just sold its 50% ownership in the Seaway Pipeline for $1.15 billion to Enbridge Inc. and the pipeline flow direction will now be turned around. This is part of a massive trend to correct the U.S. pipeline system for the new internal sources of oil and the overall increase in oil production in the U.S. and Canada. Enbridge is spending $300 million to add new pump stations and to modify old ones. By the 2nd quarter of 2012, the pipeline will be pumping 150,000 barrels a day of crude oil from Cushing to Houston. By mid-2013, the owners believe they may be able to move up to 400,000 barrels of oil a day with pumping improvements. The rejected Keystone XL Pipeline was to carry up to 700,000 barrels of oil a day from Cushing to Houston. The Wall Street Journal specualated on Thursday, 17 November that the reversal of the Seaway Pipeline might remove the commercial justification for the segment of the Keystone XL Pipeline from Cushing to Houston. I believe there will still be good reason to build that additional pipeline segment, at least if the Hardisty, Alberta to Steele City, Nebraska pipeline segment is ever approved. Perhaps a capacity of a bit less than 700,000 barrels a day will make more sense, but the projected 2013 400,000 barrel capacity of the Seaway Pipeline project could easily be matched. The reason for all this activity is because U.S. oil production, which had been declining steadily since 1985 and generally since 1970, began to increase in 2009. Production bottomed out in 2008 at 5 million barrels of oil a day and has increased by 10% since, despite every effort of the Obama administration to halt new oil production projects. Our exports of refined petroleum products have doubled in the last three years, with us now exporting 2.6 million barrels a day of oil products. We are now exporting 15% of the gasoline and diesel refined in the U.S. The main market for our exported Gulf Coast refined products is the rapidly growing Latin American market. Meanwhile, Obama has also blocked the development of the Utica Shale Oil Formation in the large Wayne National Forest in Ohio claiming concerns about fracking effects. A mineral lease auction scheduled for December 2012 has been canceled. There are already nearly 1300 oil and gas wells in that forest and the concerns about hydraulic fracturing are highly bogus. But no excuse to prevent private sector job creation is too flimsy for the Obama cutthroats. Surprise, surprise! Obama supporter Warren Buffett is a huge beneficiary of the Obama denial of the Keystone XL Pipeline, which was to carry Alberta tar sands oil to Gulf Coast oil refineries and siphon off up to 65,000 barrels a day of oil from the Bakken oil shale formation in North Dakota. The Burlington Northern Santa Fe Corporation which runs the BNSF Railway Company became a Berkshire Hathaway, Inc. subsidiary on 12 February 2010 in a huge purchase by Warren Buffett. Between them, the BNSF Railway and the Canadian Pacific Railway are the biggest railway systems able to serve the Bakken Oil Shale Formation with both incoming supplies and moving oil to refineries or to other pipeline terminals. The BNSF Railway through its connections with the Canadian Pacific and Canadian National Railways can also expect considerable business moving the Alberta tar sands oil to U.S. markets. This may be a very lucrative case of crony mercantilism between Obama and one of his biggest supporters. It is well situated to move crude oil from the Bakken oil shale formation to the Houston, Texas and Port Arthur, Texas area or to the Cushing, Oklahoma super-pipeline terminus. Because it has extensive feedlines to the Canadian Pacific and Canadian National Railways along the North Dakota northern border, it is also well-positioned for considerable traffic from the Alberta tar sands which were the primary reason for the Keystone XL Pipeline. Who knew the the many lines built to move North Dakota wheat to market would one day also be vital for moving oil to market? Let us get a sense of the size of this business. 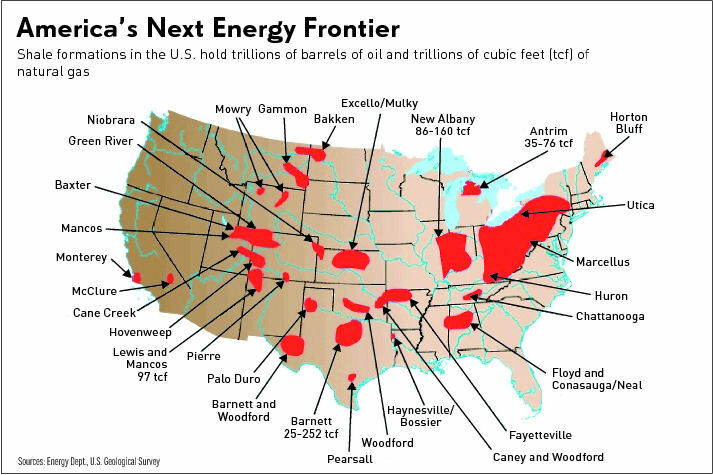 By the end of this year, there are plans to be drilling 1,800 new wells in the Bakken oil shale formation. Each new well requires 23 rail-cars of drilling pipe, frac sand, clays, and other supplies. At the end of 2010, the daily oil production was already 300,000 barrels and most of it has to be moved by truck to rail-head terminals and then by rail to markets or to pipeline terminals. A 118 car unit train can move 68,000 barrels of oil. It is thought that Bakken oil production may reach 700,000 barrels a day by 2013, so even just a delay on the go-ahead to build the Keystone XL Pipeline until after the 2012 election in 2013 will mean a huge increase in railroad business before the pipeline can be finished. There are projections that Bakken may produce 1 million barrels of oil a day by 2015. Whether the Keystone XL Pipeline is ever built or not, the Buffett-owned BNSF Railway will make good money from both the Bakken and the Alberta Athabasca oilsands. BNSF Railway is constructing sidings and turnouts and improving its yards along the railways expecting increased Bakken oil shale formation traffic. BNSF is investing $3.5 billion in 2011 to improve its infrastructure. The expenditures are primarily focused on its mid-continent routes, which are the ones needed to move oil from North Dakota to the Gulf Coast. They also move its profitable coal traffic. It was already moving several unit trains a week from the Bakken to Stroud, Oklahoma (near the pipeline center of Cushing, Oklahoma), to Bakersfield, California, to St. James, Louisiana, to New Mexico and to Texas in early 2011. They are spending $450 million to acquire 227 locomotives and another $350 million on freight car and other equipment. Another $300 million will go to terminal, line and intermodal expansion and efficiency projects. A new multi-user rail terminal is being built in Port Arthur, Texas to allow oil refineries there to be supplied by heavy rail traffic. It is to be opened in the second quarter of 2012 with generous crude-oil storage tank capacity. Oil may also be moved to Corpus Christi, Texas refineries as well. One thing rail transport does is allow more flexibility of destination for oil shipments compared to pipelines. The railroads cost more to move the oil than do pipelines, but they can offer more options to get the oil to where the demand is greatest. They can also ramp up delivery capability much faster than pipelines can because they do not have the long environmental delays! One could say the environmentalists groups are the allies of the railroads. It is also easier to tune the delivery of oil from a field depending upon the cost of production there and the cost of oil on the world market. This is important because Bakken shale oil costs more to extract than say much of the Saudi Arabian oil, so it is conceivable Saudi Arabia might sometime flood the market with cheap oil, so that production of Bakken oil should be cut back. For now, however, Bakken oil is much cheaper than oil on the world market. The expansion of the railroads is a good thing, but it is not right if one of the considerations in denying the Keystone XL Pipeline construction permits was that the pipeline would hurt Obama's friend Warren Buffett. Given the extent of crony mercantilism in the Obama administration, it is hard not be suspicious. I was drafted out of graduate school to serve in the Army during the during the late phase of the Vietnam War. We had not been winning that war early, but were winning in its later phases under General Abrams. Being involved in this war was a strange experience. We had won a war that academia and the media thought we had lost and eventually the American People bought into that wrong assessment. Then we did leave dishonorably, having abandoned the South Vietnamese to the North Vietnamese Army when our Congress shut off all support, but the USSR and China continued support to North Vietnam. Our national interest had not been great enough to get into the war and to use a draft to provide the manpower to fight it, but once you tell a nation you have their back because you believe in freedom and the universal rights of the individual, you do not abandon them in a dark alley surrounded by the enemies of freedom and the individual. America has not lacked for brave and dedicated men and women to save it from foreign threats to our security. What it has lacked is enough Americans who understand what legitimate government is. Our Declaration of Independence defined that as government that protects the equal, sovereign rights of the individual to life, liberty, and the pursuit of happiness. At that time, it was well-understood that this implied property rights, freedom of contract, and the right to earn a living were all secure from government interference. The Constitution was a mandate from the People to the government that it had very limited powers for the purpose of protecting our individual rights and for dealing with foreign governments and persons. Its internal powers were very few and limited to a postal service, post roads, patent protection, copyright protection, and establishing a uniform system of weights and measurements. Unfortunately, we Americans have corrupted that legitimate concept of government in favor of a tyranny that offers a veneer of material security at the cost of our individual rights. The real battle for our freedom today is not with foreign powers, though that matters, but with our own understanding of why we need limited government and a healthy and vibrant private sector in which we each choose our own values and have the freedom of association to cooperate with whomever we want for the purposes we want on a voluntary basis. Government is always a last resort because government dictates values and suppresses the individual whenever it exceeds the very limited function of protecting the rights of the individual to life, liberty, property, the ownership of one's own mind and body, and the pursuit of individual happiness. Government cannot deal with the complexity and uniqueness of the individual, which is why it can only function usefully to protect our basic rights. It is the private sector that allows us to be who we are and accommodate to the fact that we are all very different, have many needs to cooperate with one another, and have unique hierarchies of personal values and goals. To understand this is to understand the American Principle. I salute the Americans who have served in our armed forces. But, even more critically, I salute those Americans who understand and stand for, the American Principle. May you ever Stand Sure! After nearly four years of a recessionary period, the normally reported unemployment rate means very little due to people giving up on finding a job. Of course someone unemployed might become self-employed, but with the many hassles our governments, local, state, and federal have chosen to create for businessmen, not everyone has the stamina, or is it the foolhardiness, to become an employer. Let us check up on the real unemployment situation through October 2011. Once again, I will calculate the real number of missing jobs in our economy compared to January 2000 when jobs were plentiful and pay and benefits were sufficient to entice many Americans to choose to work. The unemployment rate was then 4.04% and there was a shortage of only 5,689,000 jobs, though much of that was really normal turnover as people chose to change jobs or career paths. The number of missing jobs can be calculated by assuming that 67.49% of Americans would want jobs now if they were available and offered good compensation as they did in January 2000. Due to the bursting of the dot com bubble in the early part of the first decade, by December 2005 the real number of missing jobs had climbed to 6.98% and that rate of missing jobs was almost identically the same when the current recession started. As we shall see, the number of missing jobs soared higher in this recession and the jobs recession has never ended. We are now missing 21,171,000 jobs, which is almost identical to the number of missing jobs in October 2010 and more than the missing job number of November 2009. 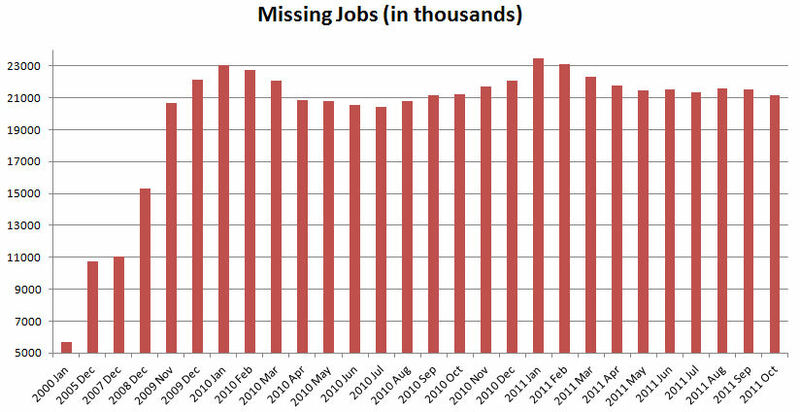 There has been no progress in decreasing the number of missing jobs in the last year or the last two years. The real unemployment rate is that given in the last row of the table. In July it was 13.21%, in August it was 13.31%, and in September it was 13.28%. In other words, there was no significant change and no improvement in the jobless rate in those three consecutive months. There appears to be a small improvement in October, though the statistical significance of any one month is usually low. The rate for October 2011 was slightly improved to 13.06%. There are no fewer missing jobs than in October 2010, however. At the October rate of improvement, this jobs recession will never end. This is hardly surprising given that the Obama administration remains as determined as ever to pursue policies contrary to the needs of employers and the economic freedoms they require and have every individual right to require. There are more missing jobs at the start of November 2011 than there were in November 2009. Two more years of Obama and we have only fallen backward on the jobs situation. The man who wants to harm whole American industries such as the coal, oil, and natural gas industries and all those industries dependent upon these industries, knows everything there is to know about how to keep America from recovering from a severe recession. The man who gave us ObamaCare against the People's wishes and against the interests of employers and the man who penalized good financial institutions and most borrowers with Dodd-Frank financial "reform", knows how to squelch investment and employment like no one else. Repeated stimulus efforts, quantitative easings of bad loans or the federal debt, subsidies of weak industries such as the green energy industries, and bailouts of overspent state and local governments have had the certain effect of weakening the private sector at the expense of a parasitic cabal of governments and crony mercantilists. Americans want to work and to create jobs, but at every turn, government policies are mounting to discourage the creation of jobs. These sorry government policies have proven very effective in creating this jobs stasis. A massive decrease in government regulations, mandates, subsidies, corporate and investment taxes, and spending is the only way out of this mess. Obama and the Democrat Socialists have a big government and anti-private sector agenda which will not allow any jobs creation to occur. The result is exactly what a rational observer would expect: A never-ending jobs recession. Government energy policy is presently directed at propping up unsustainable companies such as Solyndra which provide expensive and unreliable so-called green energy. Solyndra and others of these companies subsidized by the government have already failed with massive losses of government loan or loan guarantee money. Meanwhile, in the private sector, the massive Bakken shale oil formation in North Dakota, Montana, and Saskatchewan is producing oil so cheaply that it is selling for $30 a barrel less than Brent crude, which is used as a world oil market benchmark for light, sweet crude oil. The Bakken crude oil is of high quality and much in demand by refiners. North Dakota's oil output is now 450,000 barrels a day and may double by the 2015. This output is exceeding the capacity of present oil pipelines and more are being built, but will not come on-line until 2013. At that time, production is still expected to exceed pipeline capacity. The Bakken formation is large and fleets of oil tanker trucks are used to consolidate 70% of the oil from the wells to railroad terminals. This has led to a boom for the railroads between northwest North Dakota and Louisiana. Trucking outfits are booming, oil terminals are being built, and it is expected that two trains, each with about 104 oil tanker cars, will be filled each week. The North Dakota Pipeline Authority thinks it will have 700,000 barrels a day rail terminal capacity by next year. Moving oil by train, rather than pipeline, adds $5 to $10 per barrel of cost. But, this highly desirable light sweet crude oil is so inexpensive that adding this cost to the price still leaves it in great demand. The demand is so great that trucks, truck drivers, and tank cars are in short supply. Truckers are being supplied with free housing as well as high pay. Local trucker Lunderby Trucking, of Sidney, Montana, grew from 1 truck to 18 in the last year. Lease prices for tank cars have doubled in the last year and a half to about $1,000 a month per car. Tank car manufacturer's have backlogs and no available cars. Rational people have to wonder why our government threw away more than half a billion dollars on Solyndra so it could expand its production just before it collapsed. Similar large sums are being spent on numerous other so-called green energy company subsidies. Now, this is not a proper function of government and the stupid "investments" are no surprise. But if it were an appropriate function of government to invest in energy production, it would be more rational to help companies produce more pipelines and more tanker cars! Fortunately, we have a private sector, that though robbed of blood by many government parasites, can still perform such functions in a manner to preserve our individual liberties and to provide us with real power, relatively inexpensively and definitely reliably. And because it can, North Dakota has the lowest unemployment rate in the country at 3.5%! Obama, get out of the way and allow the private sector to provide for our energy!